Quite simply, I LOVED this book. 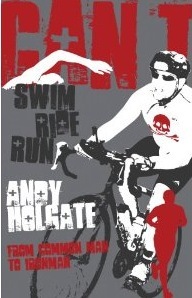 I would describe the author, Andy Holgate, as the Bill Bryson of the triathlon world. His writing is humbly witty without being forced -- a task made easier because Andy seems to find himself often in odd and humorous circumstances. The story is so genuine (he's genuine) and it's easy to identify with Andy's fears and triumphs as his inner-athlete emerges. Treasured friendships come along the way and Andy finds his place in the triathlon community. You can feel his sense of worth and purpose grow. As a fellow late-bloomer myself I can really relate. I read the entire book on my trip up to Burlington and then my friend and roomie Kimberly picked it up and couldn't put it down (well, except to race, and to eat :-). I first learned about this book when Andy was featured on the June 30, 2011 podcast of the Simon Gowan Triathlon Show. It's a fun listen but the book is even better. Andy keeps a blog called IronHolgs. His latest post is UNbelievable. I won't spoil it for you, but suffice it to say it epitomizes never ever giving up in a race. Whew. I sure hope Andy comes out with a sequel!